The Toyota Prius will soon have a competitor from Korea and rumors suggest it’ll be called the Hyundai Ioniq. 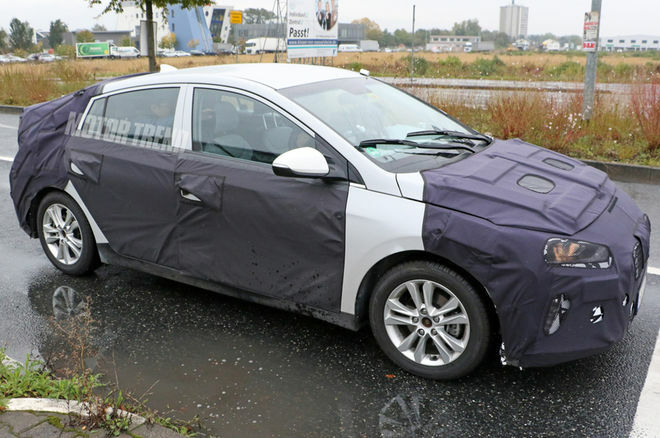 Rumors of Hyundai’s new dedicated hybrid has been swirling for a while now, but this new batch of spy photos suggests the Ioniq is pretty close to entering the ring against the Prius, Chevrolet Volt, and other mainstream hybrids. The photos also provides a better look at the interior. Previous photos of the prototype showed an interior overladen with test equipment, but this time around everything looks close to production-ready including the center stack featuring a large touchscreen and a simple layout for the climate controls. The instrument panel is a mix of analog and digital gauges and the traditional gear shifter is also pretty basic. Overall, the interior wouldn’t look out of place in a normal Elantra. When it comes to efficiency, the new 2016 Toyota Prius has set a high bar with an estimated 58 mpg in the city and 53 mpg on the highway. Meanwhile, the 2016 Volt is EPA rated at 42 mpg combined. Not much is known about the Ioniq’s powertrain. Hyundai isn’t new to the hybrid game thanks to its Sonata sedan, and rumors also suggest the automaker is developing an all-electric model in conjunction with the hybrid. Those rumors were somewhat validated with spy photos from last summer, which included the Ioniq prototype and a mystery vehicle with what appeared to be an all-electric drivetrain. This isn’t the first time Hyundai has used the Ioniq name. Back in 2012 the automaker showed off the I-oniq concept car, which was an all-electric hatchback with butterfly-style doors. That said, we expect Hyundai to launch its new hybrid by 2017.